Dustin Messer is a Boyce College graduate. He served as Editor-in-Chief of The Bantam Journal at Covenant Theological Seminary before graduating from Covenant in 2014. He and his wife Whitney live in the Dallas area and worship at Christ Church (PCA) in Carrollton, Texas. Dustin works at both Christ Church and Legacy Christian Academy. 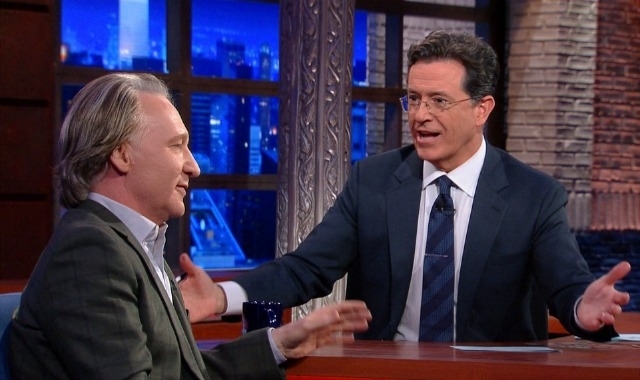 “We’re very opposite.” That’s what Bill Maher said to Stephen Colbert in a recent interview. In the conversation— which ranged from mildly awkward, to tense, to nearing hostile— Maher and Colbert take turns sharing jabs about the other’s opinion on the proper response to global terrorism, the presidential election, and religion. However, despite Maher’s claim to the contrary, the tension in the conversation was not, in fact, due to a difference of opinion— it was not because they are “opposites.” Rather, the tension was a result of a belief Maher and Colbert share, something upon which they profoundly agree. Both Maher and Colbert recognize the all-encompassing scope of Christ’s claims. Both understand that Christ’s lordship extends past the four walls of a church and reaches into the public square, the body politic. Maher’s sentiment is strong; he hedges no bets. Like many of the so called “new atheists,” Maher does not want the religious and the irreligious to “play nice,” or even go their separate ways. No, Maher sees religion as a malignant cancer in need of eradication. To be clear, it’s not only those acts of violence committed in the name of religion which Maher decries, it’s religion itself. Maher understands that religious beliefs cannot be contained— they cannot be hermetically sealed from the rest of one’s thought and behavior. Religion, in Maher’s estimation, is a menace to society precisely because it cannot be properly “private.” Faith is inherently “public” because it claims to define truth, goodness, beauty, and indeed all of reality. Thus, we can’t have people serving food, much less holding public office, who hold such convictions. After all, who knows when and where those beliefs might come out? As infamous as Maher’s views are to those with faith, Colbert’s are nearly as bad to those without. In an interview with the Catholic media outlet Salt and Light, Colbert was asked about how one balances religion with one’s political life. Colbert dismissed the question out of hand. He balked, “There is no need to balance them!” In explaining what he meant, he quoted Thomas More’s line in A Man for all Seasons, “Those who abandon their faith for the sake of their public duties will lead their country by a short route to chaos.” After quoting the line, Colbert asks, “What else do we have to inform our public life other than our conscience?” Of course, the implication is that our conscience is informed by our faith, thus our faith has direct application to the whole of life, including political life. It’s clear that neither Maher nor Colbert are likely to pick up a “coexist” sticker for their laptop. Both comedians understand the comprehensive claim being made by various faiths. All can’t be true; all can’t be equal. Each worldview— including Maher’s atheism— makes a claim that is exclusive. This clarifies the subtext in the aforementioned interview. It explains the downright awkward feel of the whole thing. Bill can’t say “you do you!” to Stephen any more than Stephen can say “to each his own!” to Bill. Both men are drawing up borders which leaves the other on the “outside.” Both are representatives of kingdoms making the exact same claim on the exact same sphere. For either to capitulate with a “if that works for you…” sentiment would be paramount to treason. Thus, the only way there can be resolution— the only way to relieve the tension— is for one party to concede, to join the other party. Our multicultural, egalitarian sensibilities don’t much care for such “either/or” ultimatums. It’s uncomfortable. It’s abrasive. It smacks of a medieval authoritarianism abandoned long ago for a more enlightened inclusivism. Yet both players in the interview understand the game, and both are competing to win. Colbert offers Maher Pascal’s wager: If you believe the gospel and it turns out to be false, you’re an idiot. If you don’t believe and it turns out to be true, you’re going to hell. Colbert understands that Maher— along with most of the audience— thinks Christianity is wrong. If Colbert’s faith is wrong, by his own reckoning, he’s an idiot. In everyone’s eyes Colbert is a clown, a fool— but he’s a fool for Christ. Just before taking on CBS’s Late Night, Colbert famously said “To be a fool for Christ is to love.” I’m not sure I fully understood what Colbert meant by this until his Maher interview. Colbert could have resolved the tension with Maher in a different way. He could’ve laughed off the question of faith and made a joke, but that’s not what he did. He embraced the tension. He entered into the foolishness. He told Maher that, outside of Christ, he was bound for hell. Why? Why did Colbert chose to resolve the tension by inviting Maher back to church, back to fellowship with Christ and his people? Colbert tells us: love. Had he been motivated by, say, peace, he could’ve saved face and changed the subject. For the sake of peace he could’ve let sleeping dogs lie. But out of love— love for his Savior, love for his church, indeed love for Maher— Colbert made a fool of himself on national television by giving a soliloquy just shy of a Billy Graham sermon to none other than Bill Maher. Knowing that everyone thought he was wrong, perhaps evil, and certainly a fool, he spoke out of love. Are Colbert and Maher opposites? In some ways. Yet, they’re also of a similar, rare ilk. In an age dominated by relativism, they are two men with the gumption and conviction to try and convert one another. The exchange should be studied by a church which finds herself in a similarly awkward, tense cultural moment. Now, more than ever, we need to be reminded that the motivation of our faith is still love, and the content of our faith is still “foolishness to the Greeks.” May we not resolve the cultural tension by changing the subject in the name of peace. Rather, may we invite all those who scorn and laugh at us into Christ’s banquet hall. In other words, may we learn from Stephen Colbert how to be better, more loving fools. I Peter 4:8…10-11a — Above all, love each other deeply, because love covers over a multitude of sins... Each of you should use whatever gift you have received to serve others, as faithful stewards of God’s grace in its various forms. If anyone speaks, they should do so as one who speaks the very words of God. O my God how does it happen in this poor old world that thou art so great, and yet so many do not find thee; that thou callest so loudly and yet so many do not hear thee; that thou givest thyself to everybody and yet so many do not know thy name?